Pasta recipes taste great when cooked with green vegetables. But this is quite different using classic bolognese sauce spiced up a little bit more than the normal version. If you're a regular pasta maker, you know how versatile is this sauce which can be used with almost any type of pasta variant. As you can see, I've not added vegetables in this pasta recipe. That does not mean you can't experiment with this preparation. Baby corns and broccoli goes so well with Farfalle pasta provided you add a generous amount of cheese as well. Right before serving, you can also sprinkle dried herbs and parsley on top. Let's quickly make this moist, scrumptious, spicy and irresistible pasta recipe for our family members. 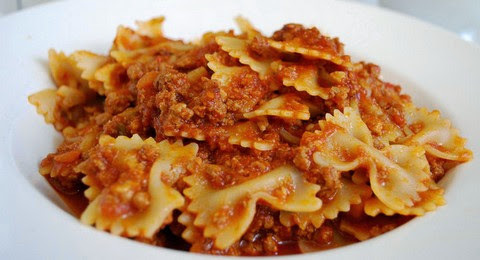 Savor this lip smacking pasta recipe consisting of hot and spicy classic Bolognese sauce made with flavorful ingredients for an unmatched taste and texture. Take a skillet and heat 4 tsp olive oil in it. Add minced onion and garlic cloves and saute for about 2 to 3 minutes. Add ground beef with salt. Switch the flame to medium and stir fry for about 6 to 8 minutes. Add 1/2 cup of water and simmer for about 15 minutes. Keep aside. Take a deep sauce pan and add mashed tomatoes in it along with semi cooked beef. Simmer on a low flame for about 5 minutes and add beef stock, carrots, celery, dry white wine and salt. Mix all the ingredients with a large spoon and close the lid. Simmer for about 30 minutes. Add Parmesan cheese, basil leaves, black pepper and oregano with 2 tsp olive oil. Again stir for about 2 minutes and simmer for 15 more minutes. Add 1/2 tsp salt in 2 liters of water and bring it to a boil. Add Farfalle pasta and let it cook in the boiling water for about 6 to 8 minutes on a medium flame. Drain all the remaining water and transfer the pasta in a large bowl. Pour hot Bolognese sauce on top of it and mix gently with a wooden spatula. Serve immediately with your favorite cheese.